Nicole Joined us in September 2016 and taught 2 3 day workshops. The project taught was new and would not be released. Nicole is an incredibly talented and hard working jewellery designer. 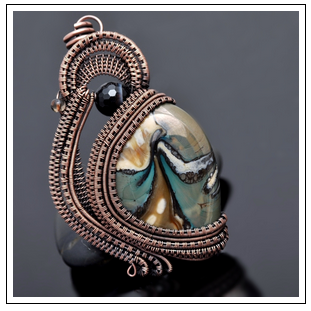 Most famous for her beguiling wire jewellery designs she also works with beads, metal and is also a very talented photographer. Jim and I first came across Nicole right at the beginning of Jims wire journey and her work, her written blog and her creativity have inspired us both. Nicole is a prolific jewellery blogger, she writes effortlessly about life, running a business, having kids and life in a small house. Her cats feature quite frequently too, playing up to the camera lens like true professionals! She also has a vibrant you tube channel with 12k subscribers! A phenomenal achievement and testament to her hard work and dedication to jewellery making. She sights her own influences as Sarah-n-Dippity, our own Imnium and Iza Malczyk. Nicole is a jewellery force to be reckoned with, she is a champion of learners, sharing her talents through tutorials from her website, her facebook page and her facebook group where she chats, shares and posts regularly. If that wasn't enough Nicole runs competitions and treasure hunts on her pages as well an online Jewellery Retreat. The project Nicole has set is a very free form design with lots of Nicole Hanna flare but with plenty of options to really be creative with the design. This means that no two pieces will come out the same at the end of the 3 days. 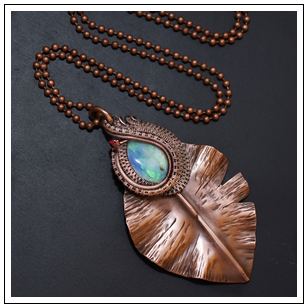 There will be lots of choice of materials, beads and cabochons and you will explore techniques that define Nicole Hanna's style but will be able to make it very personal. 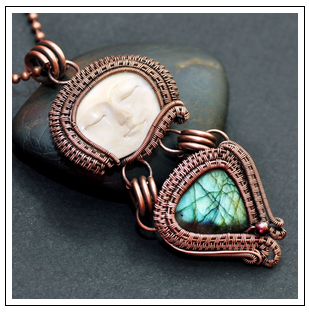 You will leave with lots of new skills and hopefully lots of inspiration for your wire jewellery design. 3 days is a perfect workshop to give you plenty of time to practice and develop your design, you may even get more than 1 made. The classes are limited to 8 so a good student teacher ratio. Class is suited to novices and more advanced wrappers, if you are very new to wire it may be worth doing a session with Lonely Soldier Designs before you come to a workshop with Nicole but the workshop will suit many skills levels.